Mashed Potato Crust Love. For Meatless Monday. Why I've been craving mashed potatoes lately, I don't know. Spring has arrived here in the high desert. The days are longer and kinder. Apple trees are blooming. And all I can think about is a mound of soft creamy mashed potatoes. This means something. Yeah. 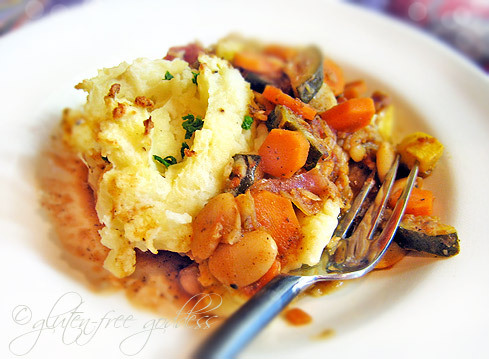 What it means is I am craving some serious comfort food in the form of a baked shepherd's pie- only my version is vegan and brimming with fresh vegetables. Forget the meat. And forget the lentils (so 1970's). And fake meat- er, I mean, highly processed soy protein or vital wheat gluten? That's why they call it seitan. No, my shepherd's pie has to satisfy not only my potato comfort craving, but my hankering for vegetables, spice and flavor. You know what that means. I live lived in New Mexico after all. It's gotta have some green chile in it. It's gotta have a little heat. Comfort food - for this gluten-free goddess, anyway- has got to have a little kick. Something to stir the taste buds awake after a long winter. Bland is so, well, yesterday. Veggie lovers, if you like your vegetable pie less spicy, use regular diced tomatoes and leave out the red chile flakes . But if you want a killer combo of heat, tang and sweet, try my version. It's not your mother's shepherd's pie, Darling. Promise. Add the canned diced tomatoes with green chile, the chopped Hatch chiles or jalapenos, vegetable broth, vegan Worchestshire sauce or balsamic vinegar, apricot jam, sage, pepper flakes, sea salt and pepper, and stir to combine. Bring to a simmer and cook until the sauce begins to reduce. You want the vegetables to be tender-crisp, not too done, and the sauce to be thickened and not too thin [if, by chance, you need a little more liquid to cook the veggies, add a splash more broth or water]. When this has been achieved, taste test the sauce for seasoning adjustments; then remove from heat, and gently add in the butter beans. Set aside. 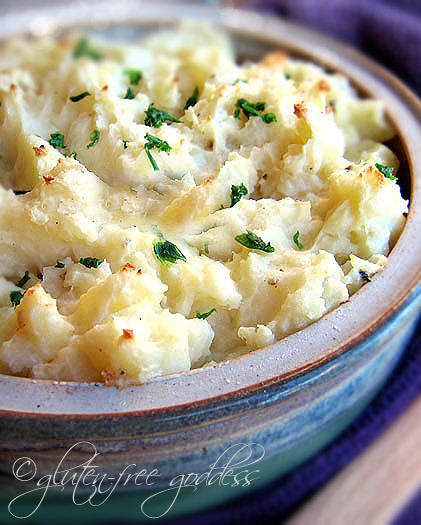 Mash the cooked potatoes with a little liquid and Smart Balance or olive oil. Season with sea salt and pepper. Add chives if you like. Taste test. Don't add too much liquid or over-mix the potatoes or they'll get gluey. Gluey spuds = not so good. Serves 4 as a meal, 6 as a side dish.